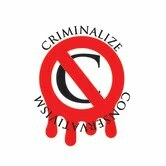 Does the criminalization of Conservatism usher in another Reign of Terror, the lining up of the old regime's leaders, advisors, and supporters (hereinafter called "sheeplets") in front of bullet-scarred walls, with blood flowing in streams outside the prison gates, while the corpses of the oppressors swing from the lamp posts? Not at all! At least for those who haven't been proven guilty of Conservative acts or propaganda leading to hardship upon any resident of the United States or upon a citizen of any country that is a member of the United Nations. And because of the genetic and mental and psychological deficiencies of the majority of the Conservative followers, as well as those of the remaining intellectually challenged and psychologically impaired needing re-training due to the failures of their parents, we certainly recommend retraining camps or other instructional vehicles to introduce them back to civil society as a step towards the path of regaining their citizenship. Educational courses must be passed by every identified Conservative sheeplet in order to be relieved from the Special 50% Followers' Income Tax, ankle bracelets, and certain Tier-one civil liberties stripped from them when Conservatism was criminalized, showing a familiarity with: the history of the Conservative Criminal Conspiracy; Civics; English, with emphasis on spelling, syntax, and grammar; history; critical thinking; ethics, logic, statistics. In addition, the requirement that every current sheeplet, advisor, or card-carrying member of any Conservative entity live in poverty in a Third World country whose majority is other than White for a year cannot be waived. Today, enlightened thought has eliminated most "cruel and unusual" punishments, but this is not universal - in present-day China, for example, corporate criminals have been executed, and stories of beheadings of women for adultery in Muslim countries have made the headlines in recent years. In ancient Greece, political malefactors were ostracized by democratic vote, banished from Athens for terms of ten years to life. In Rome too, they were exiled, and this often placed them in an safe environment where they could plot further mischief or return at the head of an army. The punishment for a person who murdered a close relative was to be enclosed in a sack with a rooster, a viper, a dog, and a monkey, then tossed into the sea. Other punishments in olden days included tar and fathering, burning at the stake, beheading, disembowelment, being sent to the galleys and other boundage, being stretched then drawn and quartered, working in chain gangs(, beatings, whipping, poisoning, eye gauging, water boarding and other tortures, branding with a hot iron, cutting off of a body part a hand for a pickpocket, an ear, eye, or tongue for a spy), the stocks, ducking, being pressed to death under the weight of heavy rocks, sent to the guillotine, hanging, and crucifixion. Modern-day methods of execution include electrocution, chemical injection, the firing squad, and hanging. (It is NOT necessary to email me with other remedies that I may have missed.) 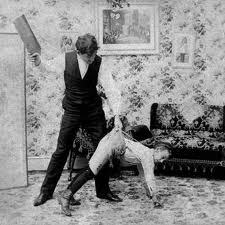 To deter future criminal conduct, arguments over which is best for society - rehabilitation or punishment - abound. Punishment is favored by today's Conservatives, but of course most would opt for rehabilitation if they themselves were deemed to be the lawbreaker. So what should the penalties be for convicted Conservative bosses - fines, jail time or worse? Is a dealer in heroin ultimately responsible for the deaths of his customer-addicts? Since many believe that the "punishment should fit the crime," there are monetary repercussions of Conservatism crimes to be considered, as well as the loss of human and animal lives generated by Conservative mobsters. Should Exxon-Mobil or BPS just be fined for oil spills caused by cost-cutting or should imprisonment or the final penalty be imposed as a punishment for lives ruined by loss of jobs and the deaths resulting from eating sea food at the Red Lobster? Should Wall Street option traders profiting from manipulating oil prices resulting in the winter deaths of our senior citizens be penalized accordingly? Conservatism's policies are derived from the single-minded devotion to profit no matter what the cost to human life, and their political activity is confined to their relentless drive for total power The linkage of state and corporation and the uncoupling of labor unions in Germany, Japan, and Italy in the last century culminated in the world-wide loss of millions of lives. But corporatism today is more subtle in so many instances: the poisoning of our air, ground, water, and food has been complemented by man-made climate change, all due to corporate excess--the placement of profits before people. A plausible argument against execution of Conservative Syndicate bosses has been the discoveries of DNA-based evidence that has freed over two thousand innocent death row inmates. So to many, death by execution may not be the answer to deterrence. 2. Life or extended prison term, with hard labor. 4. Lobotomies or other neurosurgical or biochemical techniques. 5. Shorter jail time and fines. 6. Loss of civic privileges and rights. 8. Voluntary Deportation, an option for punishments #3 to #7, above. 9. Forfeiture of Property To The State Or Restitution To The Victims. 12. One Strike And Your Out. Being a wife or child of a funeral director hardly predisposes one to wish for the deaths of our neighbors, but as to the rest of us punishment is a different matter when we examine the sufferings of citizens who have suffered at the hands of Conservative policies and actions. For the misled Conservative Stepford sheep and sheeplets, the Limbaugh self-described ditto-heads, and other extremists, many of these penalties might be considered rather extreme, pun totally intended. Some of these True Believers provide essential service to our good citizens - the sporting goods salespeople, the septic tank cleaners, the physicians and lawyers, and re-education camps might correct their wrong-headed thought and allow their re-entry into society. Even something as easy as taking and passing a Critical Thinking course at the local junior college might rehabilitate the followers of average intelligence, though the IQ-challenged might prefer imprisonment. As smart pills are still on the horizon, paycheck reductions for convicted or suspected Conservatives might be options to pursue to prevent the re-emergence of Conservative conspiracies. "When a man causes a disfigurement in his neighbor...it shall be done for him, fracture for fracture, eye for eye, tooth for tooth." Conservatives have insisted that life imprisonment and other lengthy sentence and rehabilitation programs are too costly for the taxpayer, so in the interest of fairness the debate over capital punishment for Conservative criminals will certainly continue in these pages. 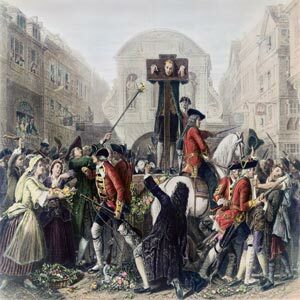 While no one other than the most sadistic of Conservatives would ever advocate torture as a viable punishment of criminals in the 21st Century, the use of the pillory and stocks, a favorite form of punishment in Colonial days - with roots going back to the medieval period - was used to engender a feeling of embarrassment, if not humiliation, in recalcitrant criminals. 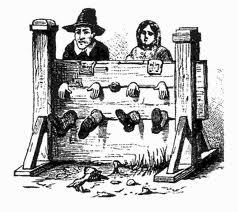 Stocks, made out of wood, were restraining devices for the wrists, ankle or neck; the pillory, also made out of wood, only held the wrists and neck but offered little protection against tomatoes - fresh or rotting - or other objects hurled at them by the populace. Wikipedia notes that the prisoners were placed in the stocks but that "(e)ither before or after this the wrongdoer might have their footwear removed, exposing their bare feet. Exhibiting an offender's bare feet was considered a form of humiliation and often led to the victim's feet being tickled, usually by children." With pillories, Wikipedia further notes, "Pillories were set up to hold petty criminals in marketplaces, crossroads, and other public places. They were often placed on platforms to increase public visibility of the offender. Often a placard detailing the crime was placed nearby; these punishments generally lasted only a few hours. "In being forced to bend forward and stick their head and hands out in front of them, offenders in the pillory would have been extremely uncomfortable during their punishment. 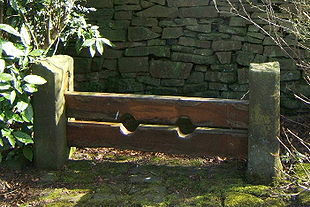 However, the main purpose in putting criminals in the pillory was to publicly humiliate them. On discovering that the pillory was occupied, people would excitedly gather in the marketplace to taunt, tease and laugh at the offender on display. "Those who gathered to watch the punishment typically wanted to make the offender's experience as unpleasant as possible. 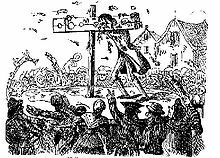 In addition to being jeered and mocked, those in the pillory might be pelted with mouldy fruit and vegetables, rotten eggs, bad fish, mud, offal, and animal excrement. As a result, criminals were often very dirty by the end of their punishment, their faces and hair begrimed with the smelly refuse with which they had been pelted."